This Elucidate5 GDPR Software Operational Practices Module creates value largely from connecting people in your GDPR network to resources including documents, privacy workflows and privacy management activities. Comprehensive risk & harms database mapped to GDPR activities, processes and IT security assets. Built-in risk classification for ease of maintenance. Get system templates that are integrated into expert data content. Easily convert systems templates into comprehensive GDPR records to demonstrate and maintain GDPR compliance. 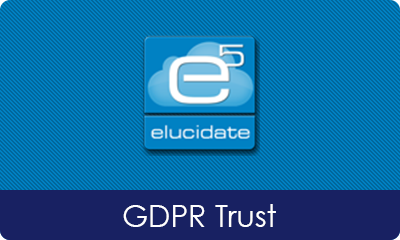 Elucidate5 Compliance manager includes built-in collaborative tools such as Email2Db, data driven GDPR Calendar, Gantt charts and more... tools that are shared across all 9 GDPR modules. Elucidate Compliance software presents a browser based user interface with multiple entry screens for 50+ GDPR Activities. The system includes a unified database that collates all evidence from your employees, consultants, legal practitioners, IT group, DPO and your security network in one system. 100+ GDPR Templates, Shared Systems-wide. Your GDPR Calendar integrated With Project Activities. Data Driven Gantt Chart, Integrated With Activities . Upload and View Evidenciary/Audit Documents. Example Screen - GDPR Compliance. commencement for Elucidate-5 when it is deployed as Software as a Service. Pricing Fixed over 5 years. Pricing Fixed for Consulting costs & hrs. Get immediate online access to elucidate CRM & Accounting in under 60 seconds. 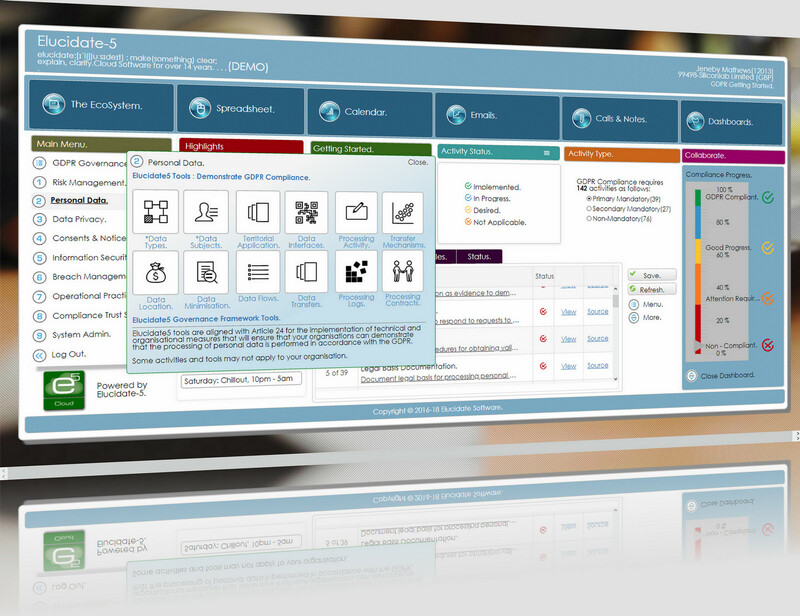 Complete only this information and you can immediately access and evaluate all modules in a demo database. Copyright © 2016-18 Elucidate Software.